Every millisecond, amazing miracles are taking place in your body. While people carry about their daily activities—speaking, thinking, breathing, moving, the 30 trillion cells in their bodies are producing a feat that should silence any atheist or evolutionist. Each cell in your body is like a car motor: it burns fuel with oxygen, gets hot and needs cooling, gives off exhaust gas, and performs work. Take a breath in–this is the intake of your motor. Breathe out—this is the exhaust. Consider how complicated an 8-cylinder car motor can be. It requires fuel in the tank, oil in the crankcase, water in the radiator, oxygen through the air intake, and an electric current for spark from the ignition. Each of these separate functions has a separate supply system. Now consider our bodies. God has designed something more wonderful–something an automotive engineer would say is totally impossible. Each separate function in our body is combined in one single system, the bloodstream. Each blood cell is a tiny motor that must be fueled continuously throughout your entire life. The bloodstream carries sugar, fats, chemicals, and minerals from processing plants to delivery points throughout the body. It carries loads of refuse material and waste to salvage yards and disposal plants, and skilled mechanics hurry along it to replace worn out or damaged parts in the cell motors of the body. All these things travel through a complex traffic control system with stop-and-go signals at every byway and intersection. The entire system is controlled by an electronic brain so that every pickup and delivery is made at the right place and time. If an intruder enters, ghostly giants (white blood cells) who repel the invader come through the capillary wall without making a hole. This police force, 35 billion strong, keeps the peace and resists invasion. One of the most amazing miracles in our bodies is the red blood cell’s contribution to our respiratory system. The blood can carry more than 75 gallons of oxygen per hour during cardiovascular activity. But oxygen can’t be carried in the bloodstream as a gas. Gas in the bloodstream causes a fatal vapor lock that stops the heart. To solve this problem, God created a complex molecule called hemoglobin (C3032 H4812N780Fe4O872S12). Tucked away inside this marvelous molecule are four atoms of iron that our lives depend on. The blood cell picks up oxygen from the lungs and converts it to a solid by the instant rusting of those four iron atoms. And the process is reversible. The oxygen is carried to a cell in the body where it then unrusts just as quickly, converting it back to a gas. On the return trip, the blood picks up extremely harmful carbon dioxide (CO2)–the exhaust gas from cells. This gas is much more difficult to handle than oxygen, because CO2 needs specific treatment to be harmless. 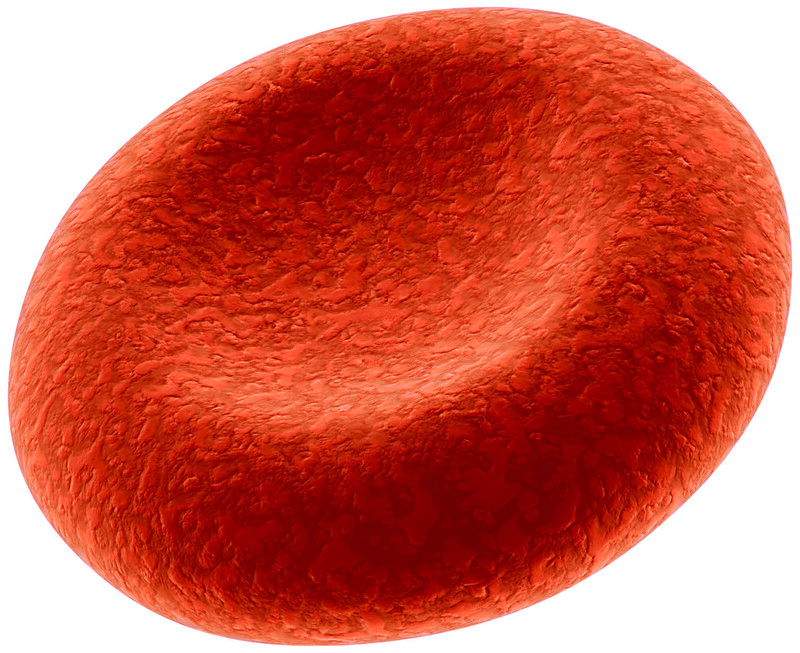 The red blood cell snatches the carbon dioxide from the tissues and hydrates it to convert it to carbonic acid (NH2). But even as carbonic acid, it is still too toxic for the body. And so the red blood cell neutralizes the acid with one of the best acid fighters known to chemists–potassium. The blood cell then dumps the carbonic acid into the bloodstream where it mixes with plasma and salt to form ordinary baking soda, of all things. It is then carried back to the lungs through the veins, and in a split second, the whole process is reversed. The baking soda is converted back into CO2 for exhaling in the lungs, and the red blood cell picks up a new supply of oxygen, converting it to a solid. This chemical miracle is equivalent to asking a man to engrave the Lord’s Prayer on the head of a pin as he is shot out of a cannon. Now what about the design of the red blood cell? Some people have said this peculiar biconcave shape is a cross between a donut and a pancake. To most of us, a sphere would seem the simplest and most logical design. It carries more volume, is the strongest of all shapes, and would pass through the cells with greatest ease. The problem with a sphere, however, is that absorption would be rapid at first and then slow down significantly. Flattening the sphere would be the next logical attempt, which would solve the problem of inadequate absorption, but it wouldn’t have enough volume. The trick would be to find a shape that combines maximum speed, maximum volume or absorption, and maximum durability. Scientists have studied the shape of the red blood cell, and using laws of gas and fusion, combined with principles of advanced calculus, have determined that the biconcave shape is in fact the best shape for the purpose of the red blood cell. To believe that these wonderful processes of our bodies all came together by chance is a huge leap of faith, not to mention intelligence. Design seems to be the only option, especially as we know more and more about genetics and the problems that field poses to the theory of evolution. But whose intelligence is involved? Certainly not ours. If we want to believe in God, we have 30 trillion good reasons pulsing through our veins. Throughout history, people have misunderstood the blood. For almost 2000 years, the tremendously popular medical practice of bloodletting was performed as a cure for a great many illnesses and diseases. This practice has for the most part been extremely harmful to patients. But if people had only read the Bible and believed what it said, countless lives might have been saved that were instead sacrificed through ignorance and superstition. The Bible tells us in Leviticus 17:11 that life is in the blood. Despite this, otherwise intelligent men and women believed in and supported bloodletting, a practice that took the lives of thousands. Even up to George Washington’s day, this practice that today would be considered negligent if not criminal, was still in vogue. On the morning of December 13, 1799, George Washington complained of a sore throat. The day had been rainy with sleet and chilly wind. In the afternoon, he went out to mark trees that he wanted cut down on his property. That night, he complained to his wife of what he believed was a touch of “ague” (fever). The physician was dispatched early the next morning, as the President was gravely ill. Nearly a pint of blood was taken. Later on in the day, another pint was taken, but all to no avail. Towards the end of the day, another attempt was made at bloodletting after which George Washington breathed his last. No wonder this man died, considering how much blood he lost—over a simple case of the flu. All the while, as he lay on his sickbed, the Bible lay beside him on his night table. If he had read and believed the clear statements of the Word of God–statements that have been there for hundreds of years—his life could have been saved. The importance of blood to the spiritual life is no less important than to the physical life—not our blood, but God’s—His blood shed for you and for me. The Bible tells us that “without the shedding of blood, there is no remission of sins” (Hebrews 9:22). It is the blood of Jesus Christ that cleanses us from all sin. Our eternal destiny hangs on our acceptance or rejection of that fact. So, each time you take a breath, whether you are running or resting, remember the miracle of your bloodstream and the One who designed it. This article is adapted from the video Red River of Life by Moody Institute.